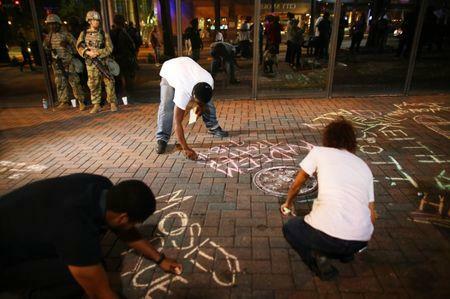 CHARLOTTE, N.C. (Reuters) - Dozens of armed National Guardsmen took up positions on street corners in Charlotte, North Carolina on Friday after the family of a black man fatally shot by police released its own video of the encounter that has sparked three days of sometimes violent protests. Few people were on the streets as the sun began to set and crowds were sparse in bars and restaurants in the Uptown section of the city. Some people heading home after work stopped to chat with Guardsmen. 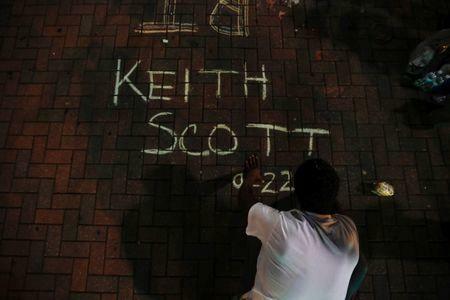 The family of shooting victim Keith Scott continued to urge officials to release their own recordings of the slaying as they called for peace in Charlotte. The moment when a black police officer shoots Scott, a 43-year-old father of seven, cannot be seen in the two-minute video recorded by his wife, Rakeyia, who can be heard urging officers not to fire. "Don't shoot him! He has no weapon," she can be heard telling officers as they yell at Scott, "Drop the gun!" Several gunshots can be heard in the video, which was released to U.S. media, followed by her screaming, "Did you shoot him? He better not be dead." The video was filmed from a nearby curb as the drama in the parking lot unfolded in front of Rakeyia Scott. CNN quoted a source close to the investigation as saying that a loaded gun had been recovered at the scene of the crime and that fingerprints, DNA and blood on it matched Scott's. The Charlotte-Mecklenburg Police Department did not immediately respond to a request for comment. Protesters have dismissed police officers' claims that Scott had a gun. Charlotte Mayor Jennifer Roberts on Friday also called for release of the police videos, in an interview with CNN. "I do think it would help in terms of transparency to release that footage," she said. Scott's death was the latest in a succession of police killings of black people, mostly men, which have unleashed protests and riots across the country and intense criticism of the use of excessive force by police. A United Nations working group on Friday compared the killings to the lynching of black people by white mobs in the 19th and 20th centuries. Scott was the 214th black person killed by U.S. police this year out of an overall total of 821, according to Mapping Police Violence, a research group whose members include protesters of a 2014 police shooting in Ferguson, Missouri. There is no national-level government data on police shootings. Charlotte-Mecklenburg Police Chief Kerr Putney has said that video taken by police body cameras supported the police version of events, but he has refused to release the video publicly. He told reporters on Friday that releasing it now could harm the investigation into the shooting, being led by the state. "I know the expectation is that video footage can be the panacea and I can tell you that is not the case," Putney said, adding that he would eventually agree with the release of the video. "It's a matter of when and a matter of sequence." Scott's family initially contended that he was carrying a book, but after viewing the police video on Thursday the family said it was "impossible to discern" what, if anything, Scott was carrying. "There's nothing in that video that shows him acting aggressively, threatening or maybe dangerous," Justin Bamberg, one of the lawyers representing the family, said in an interview early on Friday. No gun can be seen in Mrs. Scott's video. Governor Pat McCrory, a Republican locked in a tight re-election race, signed a law last week that would require authorities to obtain a court order before releasing police video. Critics have said it would prevent the sort of transparency that is needed to defuse public anger after police shootings. Democratic presidential candidate Hillary Clinton added her voice to calls for release "without delay" of the video. "We must ensure justice and work to bridge divides," she said on Twitter on Friday. She announced plans to go to Charlotte on Sunday. The UN working group recommended that the United States create a reliable national system to track killings and use of excessive force by law enforcement officials, as well as ending the practice of racial profiling. 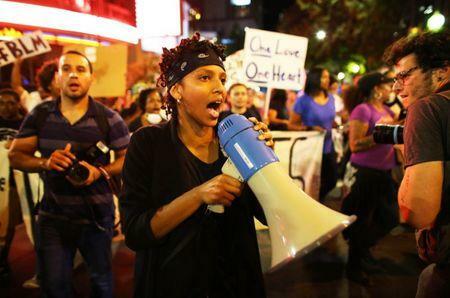 On Friday, Charlotte police arrested a civilian and charged him with murdering a protester who died on Thursday after being shot the previous night during protests, Putney told a news conference. Police identified the suspected shooter as Rayquan Borum, 21, and the victim as Justin Carr. They did not disclose Carr's age. The Charlotte Observer reported that he was 26. The killing of Keith Scott and its aftermath are playing out in a state that has been at the forefront of some of the country's most bitter political fights in recent years. North Carolina's Republican-dominated state legislature has tightened voting laws, slashed education spending and passed a law prohibiting transgender people from using the bathroom of their choice. Civil rights leaders have said that state officials who pursue these policies are partly to blame for this week's unrest. "It's somewhat hypocritical to cry out against violence when you pass violent policies," said the Rev. William Barber, who heads the North Carolina unit of the National Association for the Advancement of Colored People.